The National Centre for the Performing Arts (NCPA), Mumbai is India's first multi-venue, multi-purpose premier cultural centre built in South Asia. To know about the programs on offer, please click on each course to read details. 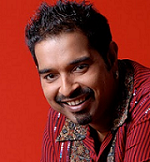 Welcome to the Shankar Mahadevan Academy, a venture that I'm truly excited about. Our philosophy is simple- to impart high quality learning in music through innovative methods while having a great deal of fun. Whether you are just starting to learn music or are an experienced student, I can assure you that this journey of music learning and appreciation will be fun and very rewarding!